Joan Stenger sent me an email recently about an unusual waterfowl observation. On a recent Saturday, she visited downtown Bristol where the creek widens a bit near the fire station and beside the park. Joan wrote that she saw a flock of ducks and Canada geese and enjoyed watching them. Photo by Bryan Stevens Muscovy ducks seen outside of Texas are domesticated versions of the wild waterfowl. Male Muscovy ducks sport red carbuncles around their bills. She said they continued to watch the flock of Canada geese and then returned home. There she consulted her bird books and only found one small mention and picture of a Muscovy duck. Armed with that information, she conducted an online search for more information about Muscovy ducks. “Have you seen many of these fellows?” Joan asked in her email. In my reply to her email, I informed Joan that Muscovy ducks are becoming more common. 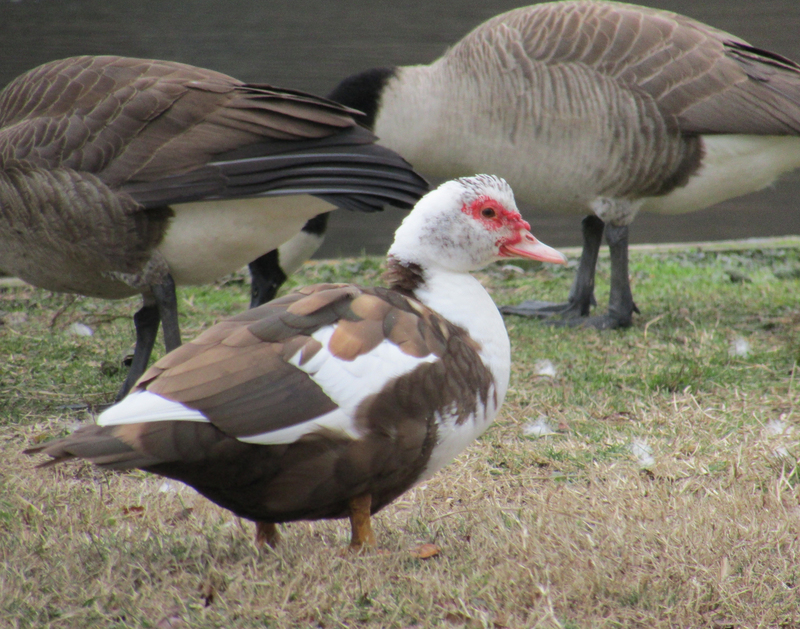 However, outside of Texas, most Muscovy Ducks seen are “feral” domesticated versions of the wild bird. Many people have probably also seen feral mallards that are content to reside year-round with us. The Muscovy ducks have probably decided the same thing. In southern Texas, it is possible to observe wild Muscovy ducks, but sightings of these ducks outside of the Lonestar State involve domesticated ducks. Like mallards, Muscovy ducks have long been domesticated, and some of the domesticated individuals have gone feral. These ducks, descendants of their wild ancestors, have become more common, both nationwide and locally. I’ve heard from other curious people over the years about encounters with Muscovy ducks. The birds behave unusually for a duck. For instance, they often pant like a dog and strut around more like a wild turkey than a typical duck. Most of these feral Muscovy ducks are also relatively tame in association with people, long ago having learned to connect humans with free handouts of bread, popcorn and other foods. Photo by Bryan Stevens Wild Muscovy ducks are dark waterfowl with white wing patches. Domesticated Muscovy ducks exhibit a wide variety of plumage colors, including brown and white feathers. In the wild, Muscovy ducks are native to Mexico, as well as Central and South America. Before Christopher Columbus reached the New World in 1492, natives had long domesticated this duck. When Columbus first visited the New World, he even took back to Europe some of these ducks. The term “Muscovy” is a reference to the Russian city of Moscow, but the reasons behind the connection of this duck’s common name to Moscow are obscure. One theory is that the duck acquired the name in association with the Company of Merchant Adventurers to New Lands, later shortened to the Muscovy Company. Perhaps this chartered trading outfit sold some of these ducks to European customers in the 1500s. After all, Columbus and early explorers named the wild turkey for the faraway country of Turkey, mistakenly believing that the New World provided a more direct route to this realm so important to trade. 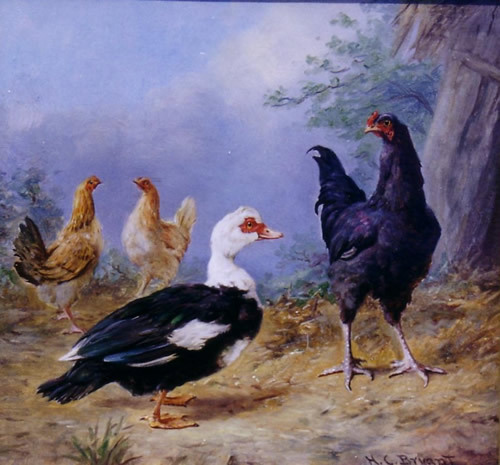 Perhaps the Muscovy duck also acquired a name connected with Moscow for no better reason. It does appear that the origins of the name are one of history’s odd mysteries. Adding to the mystery is the fact that the duck’s scientific name also refers to a city — Cairo in Egypt — far from this bird’s native home. Translated, the Muscovy duck’s scientific name means “musky bird from Cairo.” Another common name for the duck is Barbary duck, which refers to a region of Africa home to modern-day Libya. While the wild Muscovy duck is a tropical bird, the domestic ones are perfectly capable of weathering cold temperatures as low as 10 degrees Fahrenheit. Photo by Bryan Stevens Domesticated and feral Muscovy ducks are widespread across North America. These ducks were first discovered by Europeans arriving in the New World, although native tribes had long raised them as domestic animals. The Muscovy Duck has only one other close relative, the white-winged wood duck of India and Bangladesh, One of the world’s largest ducks, the white-winged wood duck is a seriously endangered species. One curious fact about this duck is its tendency to only forage for food after dark. 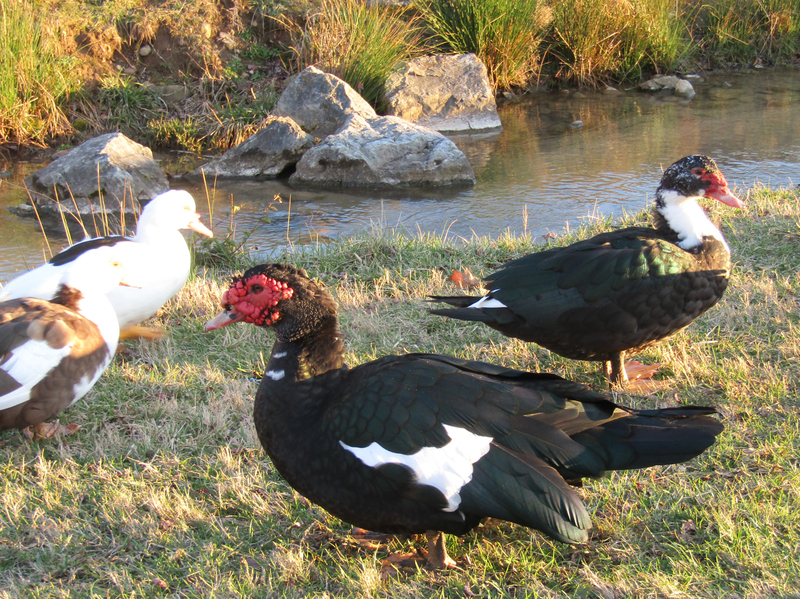 Wild Muscovy ducks are large waterfowl with a black plumage accented with big white wing patches. They can be almost 34 inches long and weigh as much as nine pounds. It’s the heads of these ducks that really make them stand apart. Both sexes have bare black-and-red or all-red faces. Males also sport pronounced caruncles at the base of the bill, as well a a slight crest of feathers. The appearance of domestic Muscovy ducks is quite variable, with some birds sporting almost entirely white plumage. 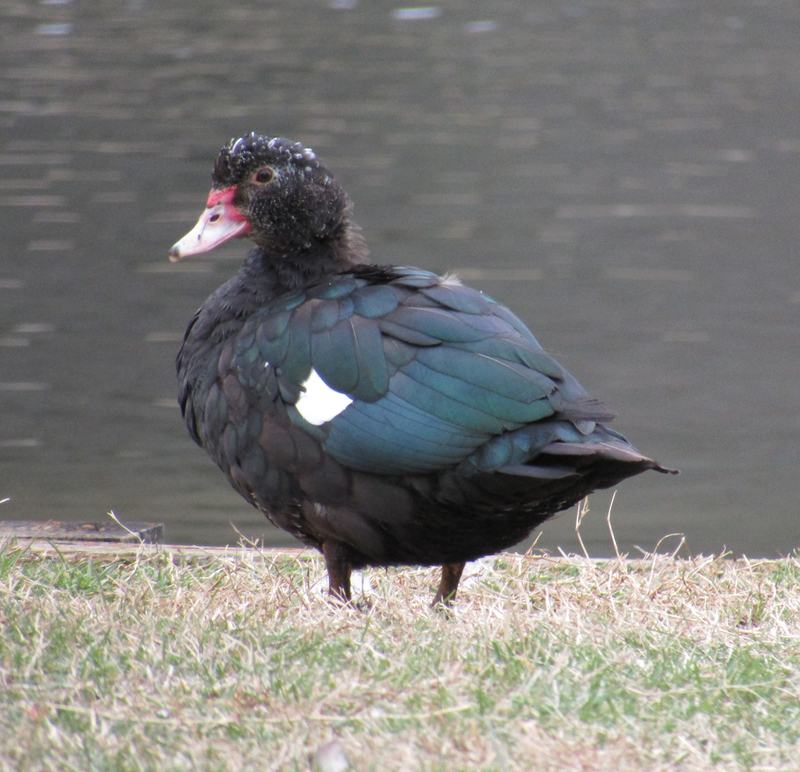 Muscovy ducks and mallards will also hybridize, producing sterile offspring that are known as “mullards.” I’ve observed both domestic Muscovy ducks and “mullard” hybrids at local parks, but I haven’t yet seen any wild Muscovy ducks. The domestic version of this duck has also established feral populations around the globe in locations such as Europe, New Zealand, Canada and Australia. In addition to asking her question about Muscovy ducks, Joan shared a story about bluebirds at her home. “We feed the birds year round and enjoy their antics at the feeders,” she reported. “We were pleased to have bluebirds raise a nest full of babies this year, although I was told that we would not have bluebirds because we live in town.” Apparently “no one told the bluebirds,” Joan joked. Because of her feeders and the bird baths, she receives visits from a good variety of birds, mostly dominated by the cardinals. This entry was posted in Birding, Birds, Bryan Stevens Feathered Friends, Carter County Compass, Elizabethton Star, Erwin Record, Muscovy Duck, Our Fine Feathered Friends, Winter birds and tagged Birding, birds, Bristol Herald Courier, Bryan Stevens, Carter County Compass, Elizabethton Star, Erwin Record, Feathered Friends, McDowell News, Muscovy Duck, Northeast Tennessee, Our Fine Feathered Friends, The Erwin Record, Winter birds on February 26, 2017 by Bryan Stevens.